Fuzzy Thoughts: ready for sea-faring adventures! 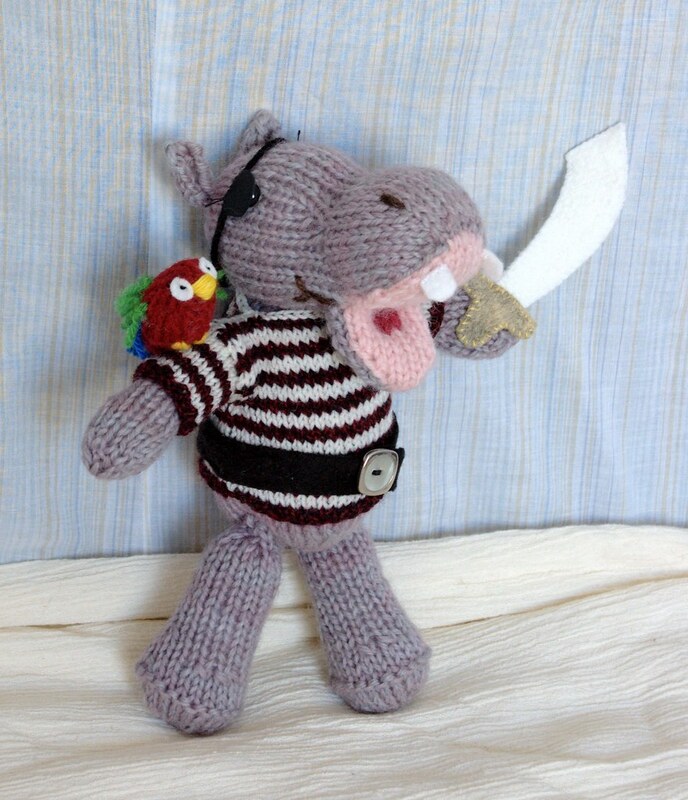 The Pirate Hippo pattern is now available in both my Etsy and Lulu shops. It took me a little longer to get ready than I thought. I needed to take new photos, and I tried to include lots of detail in the instruction. This toy is more detailed than any before, and I hope I included enough instructions so you can make everything without too much trouble. There's even a pattern for the sword, which should print out to scale, so you can just cut it out and use it for tracing. Now it's back to knitting other toys. I've had a nice break over the last couple days, getting this pattern ready. Although, I do really enjoy designing and writing new patterns. There's something so satisfying about it, like turning in an assignment you know you've done really well. Posted by Barbara Prime at 3:32 p.m.
She looks fantastic !! When I attach fringes to my penguin scarves, I use a wool needle with a large eye or a crochet hook. I also have a rug-making latch-hook. Any one of these three should work hopefully!! Can't wait until tonight to buy your pattern!! March 18, 2008 at 4:44 p.m.
March 18, 2008 at 11:31 p.m.
Do you have any turtle patterns? My sister is having a baby in May, and she LOVES turtles. So far, I haven't been able to find a cute turtle pattern on the internet, but your other stuff is just so adorable, I thought I'd ask you! March 20, 2008 at 10:14 a.m.